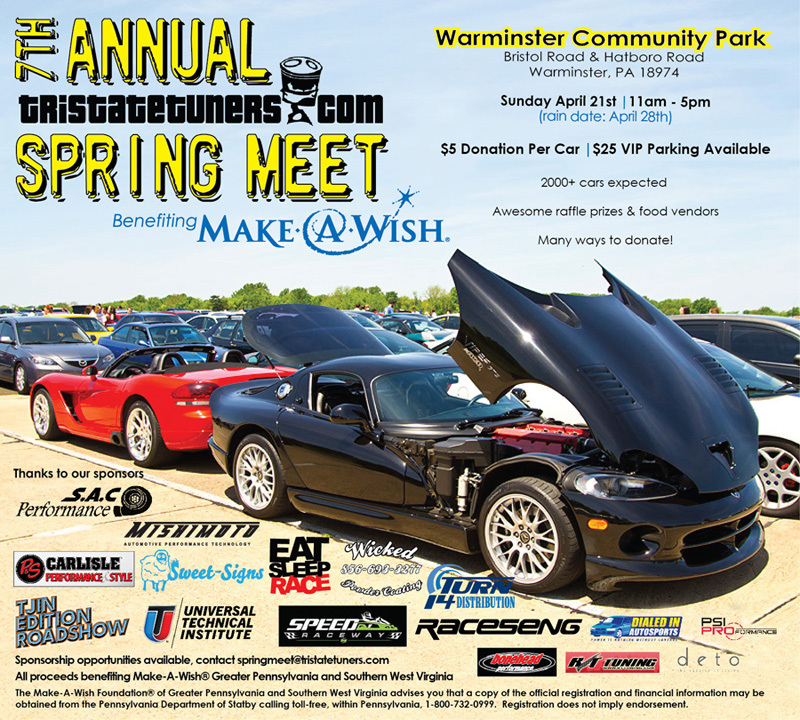 We're excited to announce The 7th Annual TriStateTuners Spring Meet, benefiting Make A Wish. We will be returning to Warminster Community Park again this year and are looking forward to another great event with all proceeds being donated to Make A Wish. Last year we hosted an estimated 2,000 cars through the day and raised over $12,000 for our local chapter of Make A Wish Greater Pennsylvania and Southern West Virginia. We will have sponsors booths set up again this year in a more central area as well as a variety of food vendors on site with some great food choices. We are also collecting some great raffle prizes that you can enter to win at the event. We are working on a couple new attractions at the event as well and will announce them if/when they are finalized. We will be collecting a $5 donation per car at the entrance to help cover our ever rising expenses, and this small donation per car will turn into a huge contribution from our group to Make A Wish to help make this our most successful event yet. VIP Parking will also be available again this year for a $25 donation prepaid via Paypal (or at the gate if spaces remain) to reserve a spot for your car in the primary parking section close to all the action. If you choose VIP Parking you will not also be required to make the $5 per car donation mentioned above. There will be many worthwhile and fun ways to donate at the event so please keep that in mind so we can raise as much money as possible. As always, all proceeds will be donated to Make A Wish Greater Pennsylvania and Southern West Virginia. You can expect a huge variety of cars from all of the tri-state area and beyond so start getting ready and we'll see you there! Check out our Officlal Facebook Event Page for The 7th Annual TriStateTuners Spring Meet. Please visit and RSVP there to show everyone that you're planning to be at the meet. After you RSVP make sure to invite all of your friends on Facebook to make sure that everyone knows about it! While you're on Facebook, you can Like TST's Fan Page too! We are working on updating the website for this year's event. Donate $5 per car at the entrance: This year we will be collecting a $5 donation from each car at the entrance to help cover the additional costs of the event this year, and to ensure that we make this the most successful event yet with an even bigger donation than last year. *Donate by getting VIP Reserved Parking: We have made VIP Reserved Parking at the front of the main lot available to those who make a $25 donation prepaid via Paypal. This will ensure your car is close to all the action. We may have a limited amount of spots for people at the gate, but when they fill up they're gone, so we recommend prepaying for this if you are interested. Those who choose this option will also receive $10 worth of raffle tickets as a bonus. To reserve your VIP Parking spot today please CLICK HERE to make your donation via Paypal. We are designing new event t-shirts for this event which will be available for sale at the event and will update info on this as we have it. All proceeds from Sonic Meet shirt sales will be donated to Make-A-Wish. *Donate by buying TST Merchandise during the meet: TST stickers, t-shirts, hoodies, and more will be available for purchase at the event. 25% of all TST Merchandise sales at the event will be donated directly to Make-A-Wish. *Donate by purchasing food at the event: We are working with a variety of food vendors to make sure everyone has the option to eat some good food at the event this year, and a portion of the food sales from the event will be donated directly to Make-A-Wish. It is extremely important that everyone be on their best behavior to represent TriStateTuners and Make-A-Wish well this year so that we will be invited back to do this all again next year! Thanks in advance for your cooperation in helping make the meet a success. Please help us promote the event on other forums to help us spread the word far and wide! 4) Add a title to your new thread similar to "The 7th Annual Spring Meet, benefiting Make-A-Wish! April 21, Warminster, PA. 2000+ Cars" and submit your thread. We're still looking for sponsors for the event to make a donation and/or provide items to raffle off so if anyone reading this is interested or knows someone who might be, please email SpringMeet@TriStateTuners.com for more info. All proceeds are going to Make A Wish, and this is a great opportunity to give back to the community in a fun way! Please contact the organizers at SpringMeet@TriStateTuners.com if you have any questions, suggestions, or interest in getting involved. I went to this event last year and it was fun. So many nice cars and enthusiasts. For those thinking of attending. FYI, 98% of cars attending are modified in some way.